Speakers in the seven cities called on the Social Democratic Party to decline their support for CETA approval in a party convention Monday that is set to decide on the matter. Next week, the European Union ministers of trade and economy will meet in Bratislava to decide if they go ahead with CETA. In Munich, farmer Gertraud Gafuß, chair of the Arbeitsgemeinschaft bäuerliche Landwirtschaft (ABL), called for a trade policy more fair to small and medium-sized farmers. The ABL joined with the National Family Farm Coalition in the US and the National Farmers Union in Canada to call on politicians to not give one-sided support for big food companies through the current trade politics. Ilana Solomon, director of the Responsible Trade Program, Sierra Club (USA), warned against a turn backwards in energy politics through a reinvigorated oil and gas trade, which would boost more fracking in the US. Solomon said the protest marchers in Germany and all over Europe were not at all alone, but had partners in environmental and other organisations on the other side of the Atlantic. The European Commission hopes that CETA can finally be approved by ministers this week. Commission President Jean-Claude Juncker, in his state of the European Union speech this week, called it the “best trade agreement we have ever negotiated.” TTIP meanwhile has been called no done deal, especially given a potential change of government in the US. 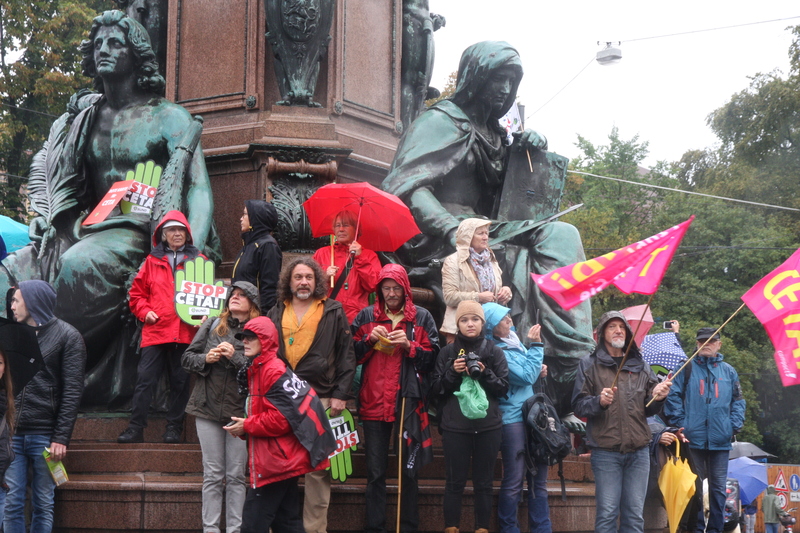 Protesters were unimpressed by the rain. 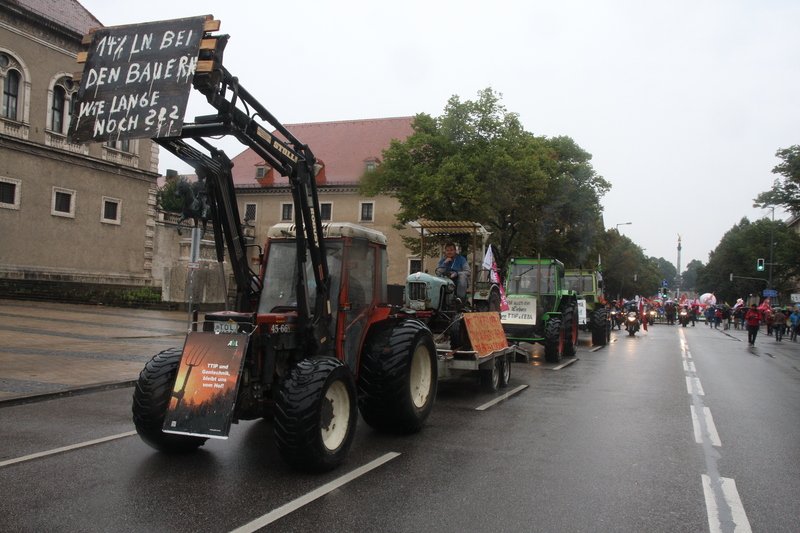 In Bavaria and Baden-Württemberg several groups have called for referendums over the trade agreements. 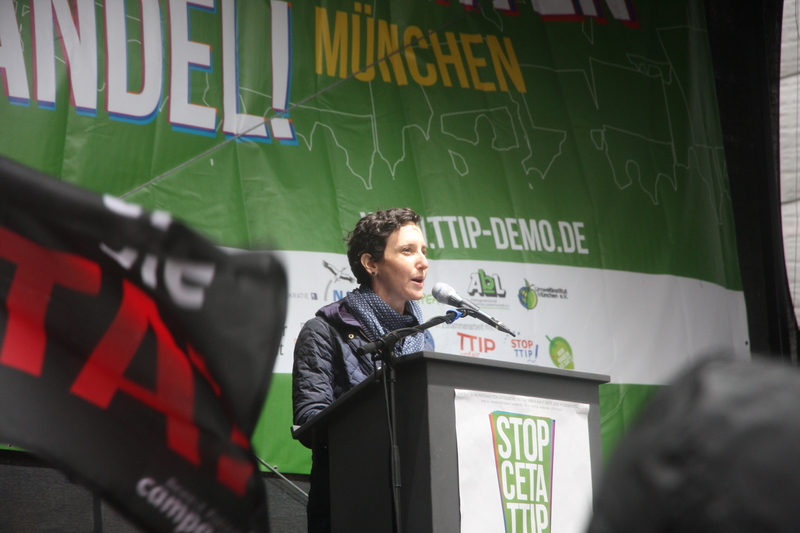 "Mass Protests Against TTIP, CETA In Germany" by Intellectual Property Watch is licensed under a Creative Commons Attribution-NonCommercial-ShareAlike 4.0 International License.